Ooi-juku flourished very well among 17 post stations in Mino and there are buildings left, that remind us of ancient times, such as Honjin-mon Gate, inn, shoka, etc. The Nakasendo, which passes through Ooi-juku, remains in length and width just as it was and there are 6 masugatas left, the best along Nakasendo. Hiroshige Museum of Art, Ena, which is located on the station street, possesses and displays an entire set of “Kiso-kaido Rokujukyutsugi-nouchi” by Eisen Keisai and Hiroshige Utagawa and Hiroshige’s ukiyoes, etc. It has a navi-room for studying ukiyoes enjoyably, in which youcan experience overpainting with simulated printing blocks. In this portion of the course, the Nakasendo as a whole remains in width,etc. as it was and most of this portion of course remains unpaved. Especially this unpaved portion was well-organized as part of the historic roads renovation project by the Agency for Cultural Affairs and remains just as it was. There are many remains and high spots, such as “Saigyo-zuka” “Makigane-no-Ichiri Zuka (which gives us a splendid view),” “Iwai Pass (Himegoten ruin)” (it was said that it gave us a view of Magome far away),” “Midarezaka (where Daimyos Procession was disordered? 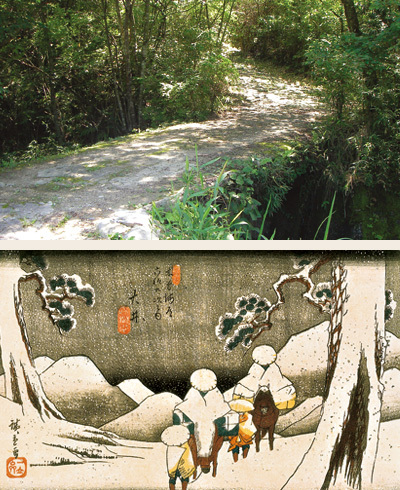 ),” “Benizaka-no-Ichiri Zuka,” “Botan Rock (a 5-meter diameter rock in stone pavements),” “Fukagaya roadside rest station honjin ruin,” “Gongenyama-no-Ichiri Zuka (just 90 rito Edo)” and “Shirihiyashijizo,” and theNakasendo and Tokai Nature Trail pass through almost the same course from here to behind Ontake-juku. Most of this portion of the course is occupied by Jusan Pass, where it is hard to walk.